Widely used in aromatherapy, geranium essential oil helps to balance hormones, relive stress, and improve circulation. The soft, floral aroma of geranium is both uplifting and relaxing, the perfect combination to inspire fresh thoughts and ideas. Lavender has been as a refreshing perfume in the home for centuries. The sweet floral aroma is used in aromatherapy to ease exhaustion, insomnia, irritability and depression. Lavender is believed to relax brain waves and reduce stress, and has even been found to reduce errors when used as a scent in offices! 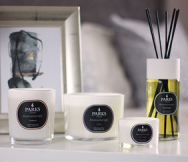 These properties make it a vital perfume in our Inspiring diffuser. Orange oil has a cheerful and uplifting scent that not only refreshes your home, but can also help to alleviate anger, anxiety and depression. The smell of orange creates a happy, relaxed ambiance - the perfect environment to encourage and inspire. Combined, these three natural scents can work wonders on your productivity and motivation. Use this perfume diffuser in your home office or living to create a positive, inspiring atmosphere.